Germany's Oliver Ortmann won the World Straight Pool Championship. In a tight final he beat surprise package Huidji See (Netherlands) 200-171. The losing semifinalists were Martin Kempter (Austria) and Danny Harriman (USA). This was the German's second world title. In 1995 he won the World 9-ball Championship. 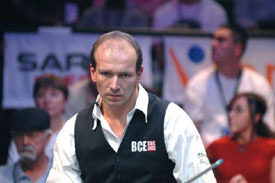 In straight pool he has won five European titles (1987, 1989, 1990, 2000 and 2006). Ortmann took home $12,500 for the win. See got $5,500 for his second place finish. Defending champion Thorsten Hohmann (Germany) lost 200-171 to Kempter in the quarter-finals. There were three women in the 64-player field; Jasmin Ouschan (Austria), and the Korean Cho sisters Bo Ram and Yu-Ram. Ouschan proved that last year's fifth place finish was no fluke by posting an impressive ninth place. The Chos failed to advance from the group stage with 2-5 records. Word is that matches will be aired online for free at www.dragonpromotions.com in the end of the month (July) and later aired on www.propoolvideo.com. The event was held July 9-14 at the Hilton Hotel in East Brunswick, New Jersey, USA.